Ukraine’s Right Sector leader Dmitry Yarosh said his radical movement rejects the Minsk peace deal and that their paramilitary units in eastern Ukraine will continue “active fighting" according to their "own plans." The notorious ultranationalist leader published a statement on his Facebook page Friday, saying that his radical Right Sector movement doesn’t recognize the peace deal, signed by the so-called 'contact group' on Thursday and agreed upon by Ukraine, France, Germany and Russia after epic 16-hour talks. The Russian Investigative Committee started criminal cases against several members of the radical Ukrainian groups over charges of fighting against the Russian military in the Chechen wars of the 1990s. Right Sector’s Dmitry Yarosh also faced a separate criminal case over public calls for extremist activities. Moscow charged Yarosh in absentia, demanding his arrest. In July last year the Interpol put Right Sector leader Yarosh on its wanted list. ThisJanuary, Russia’s Supreme Courtbanned the activitiesof the Right Sector within the country. The radical movement was formed as a coalition of nationalist and neo-Nazi organizations during the Maidan protests in Kiev at the end of 2013.While wearing Nazi insignia, Right Sector fighters used clubs, petrol bombs and firearms against Ukrainian police during the EuroMaidan protests. Last year, Kiev organized the National Guard force comprising former and current Ukrainian troops and volunteers from EuroMaidan “self-defense” squads. The National Guard was enabled to carry out the functions of any law enforcement agency by a decree signed by then-acting President Aleksandr Turchinov. However Yarosh denies any of his fighters joined the National Guard. He believes his own units are better organized. A number of volunteer pro-government battalions were also organized in Kiev – among them Aidar, Azov and Donbass. Human rights group Amnesty International reported in September that Aidar members operating in the north of the Lugansk Region “have been involved in widespread abuses, including abductions, unlawful detention, ill-treatment, theft, extortion and possible executions.” Troops from the Ukrainian Azov and Donbass battalions were reportedly seen wearing Nazi paraphernalia such as swastikas and SS badges. In March 2014, the extremist Right Sector decided to become a political party, nominating Yarosh for president. The same month over 1,500 nationalists from Right Sector circled the Ukrainian parliament in Kiev, threatening to storm it and capture Interior Minister Arsen Avakov. In May 2014, Right Sector radicals reportedly descended on Odessa, where a standoff with anti-Kiev demonstrators resulted in dozens of people being shot, burned alive and even butchered with axes in the city’s Trade Unions House massacre. 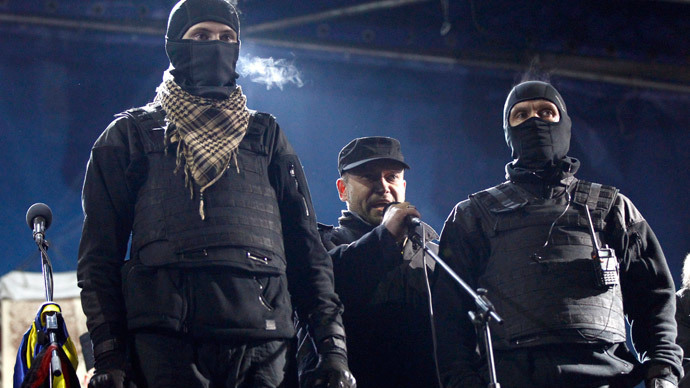 Despite his notoriety, Yarosh was elected to be a member of the Ukrainian parliament (Verkhovnaya Rada) to head the Right Sector political party. The radical movement has refused to acknowledge the authority of the Kiev government and even threatened its top figures. In September 2014, Yarosh said he could oust Poroshenko“like Yanukovich” while Right Sector radicals staged a violent rally in front of the presidential HQ in Kiev. In January, Poroshenko’s aide told national TV that Right Sector paramilitary units had refused to come under the command of Ukraine’s Defense Ministry. Yury Biryukov said that he “personally proposed a full legal clearance scheme to Right Sector,” but they “turned down this service,” expressing a wish to remain autonomous and report to nobody. Meanwhile, the US military has recently announced it would deploy soldiers to Ukraine this spring to train the country’s National Guard.